In a land environment, temperature and precipitation are the most important factors that determine which species can survive. In aquatic environments, water temperature, the amount of sunlight present, and the amounts of dissolved oxygen and salt in the water are important. Earth's freshwater ecosystems include flowing water such as rivers and streams and standing water such as lakes, ponds, and wetlands. Rivers and Streams Flowing freshwater environments vary from small, gurgling brooks to large, slow-moving rivers. Currents can quickly wash loose particles downstream, leaving a rocky or gravelly bottom. As the water tumbles and splashes, as shown in Figure 15, air from the atmosphere mixes in. Naturally fast-flowing streams usually have clearer water and higher oxygen content than slow-flowing streams. Most nutrients that support life in flowing-water ecosystems are washed into the water from land. 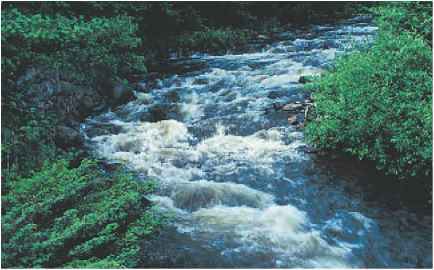 In areas where the water movement slows, such as in the pools of streams or in large rivers, debris settles to the bottom. These environments tend to have higher nutrient levels and more plant growth. They contain organisms that are not as well adapted to swiftly flowing water, such as freshwater mussels, minnows, and leeches. ■ Compare flowing freshwater and standing freshwater ecosystems. ■ Identify and describe important saltwater ecosystems. ■ Identify problems that affect aquatic ecosystems. All of the life processes in your body depend on water. Figure 15 Streams like this one are high in oxygen because of the swift, tumbling water. 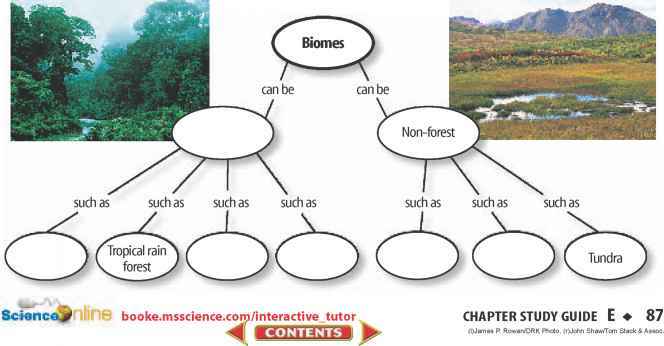 Determine where most nutrients in streams come from.